Why do you think those with a humanistic worldview are so intent on providing taxpayer funded “early childhood education”, opposing vouchers for students to attend non-government schools, and generally “evangelizing” young people with unbiblical evolutionary, environmental, and sexual ideology? The answer is simple: change the children, change the future. Christians, churches, and missions organizations would do the same, only with a biblical worldview—to even more resources and efforts on evangelism and discipleship for children. Reese Kauffman, our guest this weekend on The Christian Worldview, leads a ministry called Child Evangelism Fellowship that has been doing just that for the past 80 years. He will explain how child evangelism changes hearts and homes in the farthest reaching parts of the globe and right here in America. NOTE: Child Evangelism Fellowship (CEF) is offering listeners to The Christian Worldview a copy for the book Every Child, Every Nation, Every Day for a donation of any amount to CEF (normal retail is $14.99). To order, call 1-800-300-4033 and mention that you heard this offer on The Christian Worldview. 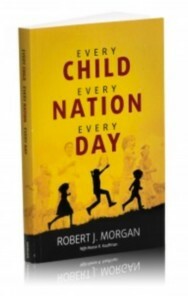 Book description: Author Robert J. Morgan, best-selling Gold Medallion Award winning writer, briefly highlights the advances of Child Evangelism Fellowship® by describing Reese Kauffman’s journey with the Lord and faithful service as president of CEF® for the past 26 years.